While at first sight it would appear that this clause requires Inmarsat to actually fit some filters, I believe that Inmarsat will argue they are given “absolute discretion” to simply replace any terminal that is affected by LightSquared’s operations, using the new filter technology it has developed, and of course no terminals will be affected if LightSquared never operate a terrestrial network. The MSV Parties shall not be entitled to operate under the Phase 2 Spectrum Plan or benefit from the operational parameters set forth in Section 3.5 [ATC Operations] until such time as the payment under this Section 4.4 is made to Inmarsat. The arrangement contains contingencies related to possible interference issues with LightSquared’s spectrum, including the right of Sprint to terminate the arrangement if certain conditions are not met by LightSquared. As of December 31, 2011, the Company had received $310 million of advanced payments from LightSquared for future services to be performed under the spectrum hosting agreement. Beginning in December 2011, through a series of amendments, the arrangement was modified to, among other things, extend the date in which Sprint has the right to terminate the arrangement and suspend Sprint’s obligation to incur any further cost or expense related to performance under the original agreement. Under the amended arrangement, Sprint, for any reason, including but not limited to FCC action or inaction, or no reason at all, may terminate the agreement after March 15, 2012 and before April 30, 2012. If LightSquared secures lender’s consent for modifications to the agreement, Sprint’s right to terminate will be deferred until June 25, 2012 and will continue through December 31, 2012. In addition, the parties definitively agreed that approximately $236 million of the total $310 million of advanced payments made by LightSquared represent payment for incremental costs or obligations incurred by Sprint under the original agreement in support of LightSquared. The parties agreed that this amount is irrevocably and unconditionally paid and will not be subject to dispute or claim by LightSquared. Accordingly, Sprint will refund up to approximately $74 million of Lightsquared’s initial prepayments, of which $65 million will be paid on the earlier of LightSquared’s lender’s consent or March 15, 2012, and the remaining $9 million will remain subject to the termination and unwind provisions of the original agreement and will be returned to LightSquared upon termination, less any additional incremental cost or obligations incurred by Sprint in support of LightSquared. In the event the arrangement is terminated for LightSquared’s material breach, non-payment or insolvency, Sprint maintains a second lien on certain of LightSquared’s assets, including spectrum assets. Thus in December 2011, LightSquared definitively agreed to forfeit $236M of its advance payments to Sprint if they were unable to move forward which the agreement, which seems a huge sum of money when it appears Sprint had done basically nothing in terms of deployment apart from some initial network planning. Clearly LightSquared were deluding themselves as well as investors in December when they insisted that approval was going to be forthcoming in early 2012. However, this now puts further pressure on LightSquared to file for bankruptcy within the next two weeks, so that the December 15 revision to the Sprint agreement does not fall outside the 90 day bankruptcy window for review of recent contracts and payments. Fundamentally I think that what both of these problems come down to is that in its negotiations LightSquared appear to have only considered the outcome if they were successful in deploying a network. I’m told that Inmarsat certainly focused most intently on the default provisions, because they always expected LightSquared to fail, and Sprint appear to have done likewise in demanding an upfront payment and then concentrating on retaining that money once LightSquared failed to get approval for their network. Both Harbinger and LightSquared were truly putting it all on red. 2011 was a very tough year for Inmarsat, when the company struggled to grow its MSS revenues at all in the face of a shipping downturn and military pullback from Afghanistan. Now 2012 has started on an even worse note, with LightSquared defaulting on its $56.25M Feb 18 payment to Inmarsat. In the face of this pressure, Inmarsat have adopted a somewhat surprising response to increase their revenues. Inmarsat indicated in the latter part of 2011 that maritime E&E prices would be increased from January 1, 2012 in an attempt to shore up legacy maritime revenues. This move was at least somewhat logical, as it did not affect the early adopters who would be most likely to churn to other services. However, in early 2012 Inmarsat also announced they were withdrawing the wholesale voice price cuts made in early 2011 when they trumpeted a suggested retail price of $0.55 per minute for FleetBB and FleetPhone voice calls. I’m told that apparently these wholesale price cuts had simply been absorbed by Inmarsat’s partners, and had not led to widespread retail price declines (because Inmarsat’s maritime crew calling rates were still uncompetitive with Iridium), but they did have a major negative impact on Inmarsat’s maritime voice revenues in 2011. Even more remarkably, this week Inmarsat have just told partners that they will be increasing the price of ISatPhone Pro handsets by about 20% and withdrawing the two year prepaid card expiry for low value cards that I criticized back in 2010. It therefore appears that Inmarsat has finally recognized (as Iridium very bravely concluded when they continued with a premium handset strategy) that there is very little churn in the MSS handheld market and this cannot be increased simply through lowering prices. UPDATE (2/27): I’m told that Inmarsat is also increasing the monthly subscription prices for postpaid ISatPhone Pro service very substantially, and we are likely to see retail prices rise by around $15 per month (in other words what is currently a ~$200 per year service for low end customers would potentially double in price). I’ve not yet managed to confirm when this price rise will take effect. This is likely to cause quite a lot of upheaval as distributors figure out how to reposition the ISatPhone Pro once it is no longer pigeonholed as the “cheap and cheerful” satphone option. Taken individually all of these changes therefore seem to have a rational basis, but it has to be very worrying when distributors have to go and explain to their customers that Inmarsat’s prices are being increased in numerous different areas, when historically customers’ biggest complaint about Inmarsat has always been that they get a great service but are being gouged on price. This also comes in the context of a wider telecoms sector where it is almost universally accepted that prices will go down and services will improve each year. While these changes may be sufficient to allow Inmarsat to achieve (at best very modest) positive growth in MSS revenues during 2012, they could also set up more difficult comparisons in 2013, especially if some customers opt for competitors’ services instead. More broadly, Inmarsat need their customers to respond positively to the company, especially now that direct sales are being emphasized and when Global Xpress is poised to enter a much more crowded maritime VSAT market in a couple of years time. As a result, it will be interesting to see how views on Inmarsat develop across the MSS industry as these price changes filter through to end customers, and whether customers’ satcom choices are affected in the future. Close scrutiny of the spectrum related legislation in last week’s jobs bill appears to give a pretty comprehensive outline of the deal that is to be expected between the FCC and DISH over its transfer of control and waiver request for the TerreStar and DBSD spectrum. In particular, the FCC is tasked with auctioning the H block spectrum (1915-20/1995-2000MHz) and extended AWS-3 block (2155-2180MHz) plus 15MHz in the 1675-1710MHz band (presumably the 1695-1710MHz block previously recommended by the NTIA, though note update below), as well as identifying an additional 15MHz of contiguous spectrum to be auctioned. Assuming that this additional 15MHz of spectrum is intended to be contiguous with the other spectrum listed above (rather than being a single 15MHz contiguous block), then it appears that DISH will give up 2x5MHz of its 2x20MHz of DBSD/TerreStar spectrum (2000-05/2180-85MHz), and move its uplink frequencies up by a further 5MHz into the original J block uplink (2020-25MHz) in exchange for the waiver, and so that there is no windfall to be criticized as in the case of LightSquared. This would leave DISH with 2x15MHz of spectrum at 2010-2025MHz (uplink) and 2185-2200MHz (downlink) and would implicitly create a new guardband in the 2000-2005MHz block (though the FCC would apparently still be supposed to auction this spectrum) and a new paired block at 2005-10/2180-85MHz to be auctioned (though this block would likely be repurchased by DISH or its partners in the ensuing auction because it would have relatively little value to other players). As Walt Piecyk at BTIG Research previously noted, Sprint should also then be well positioned to add the H-block spectrum to its G-block LTE network (assuming that the 1915-1920MHz uplink would not interfere with the PCS downlink spectrum at 1930MHz). Alternatively if the FCC really does intend to auction a single contiguous 15MHz block then I would expect DISH to give up 10MHz of its uplink spectrum, and move up into the J block uplink, creating an asymmetric 10x20MHz allocation with 2015-2025MHz uplink and 2180-2200MHz downlink. That might allow an extra 10MHz downlink of downlink to be inserted above the H block (at 2000-2010MHz), with an implicit guardband left at 2010-15MHz. Given the much higher value of downlink spectrum in a carrier aggregation model, this trade would potentially allow the FCC to raise much more money from a subsequent auction (though it would also prevent DISH from buying back the 2x5MHz it had given up). Based on an ex parte filing by DISH last week, the company is also prepared to accept conditions to “facilitate competitive carriers’ access to DISH’s planned nationwide wireless network”, and presumably with these concessions the FCC would permit a relatively relaxed buildout mandate as DISH has requested. An extended timeline would also help DISH because the re-auction of the spectrum they would give up would probably come ahead of the activation of their new network, and potentially therefore allow 2x20MHz operations from launch (assuming DISH repurchased the spectrum). However, AT&T is fighting a rearguard action to impose the same buildout conditions as LightSquared and therefore remove DISH’s flexibility to ally with alternative partners, which it seems could include not just MetroPCS or DirecTV but perhaps even T-Mobile and/or America Movil. Of course the more credible DISH’s alternative plan is, then the higher the premium that AT&T would have to pay to take over DISH, but based on DISH’s filing there appears to be no doubt that the FCC is determined to ensure wholesale access to DISH’s LTE Advanced network remains available to other operators, whether or not DISH is taken over by AT&T. After approval of the TerreStar transfer of control by the Canadian regulator two weeks ago, it now appears that the FCC is expected to announce its ruling in the first half of March, so we should know the answer to all of these questions very soon. UPDATE (2/22): With respect to the 15MHz of spectrum to be identified in the 1675-1710MHz band, this was originally expected to be an uplink band (to be paired asymmetrically with the AWS-3 downlinks), and would therefore most appropriately be located next to the AWS-1 uplinks at 1710-55MHz. However, I understand that there is pressure to use this 15MHz of spectrum for either carrier aggregation downlinks or TDD operation, which would not be feasible right next to the AWS-1 uplinks. As a result, it is plausible that the 15MHz of reallocated spectrum could be moved to the bottom of the band (1675-90MHz), adjacent to Crown Castle’s 1670-75MHz block, which is leased to LightSquared Inc.
Harbinger has previously stated that it plans to sell this spectrum to raise money and the potential windfall from the spectrum bill creating a contiguous 20MHz block of spectrum might increase its value significantly. Harbinger would presumably hope to pay off the term loan of roughly $300M which is due for repayment on July 1 (this is separate from the debt secured by LightSquared’s satellite assets), and that would require the 5MHz block to achieve a value of around $0.35-$0.40/MHzPOP once the costs of buying out the Crown Castle lease are taken into account. Though that may be feasible, with only a small 5MHz sliver of spectrum being sold, it seems unlikely that this sale could raise enough to provide a meaningful amount of additional capital or any return to Harbinger on their previous investment in the company. In addition, it is much harder to see any use for the 8MHz of 1.4GHz spectrum leased from TerreStar, and so it is unclear how long this lease will continue. However, for once it seems plausible that Harbinger might have finally found one small block of spectrum that the government can enable them to actually make a profit on. Its just a shame that so much more money has been wasted on unusable satellite spectrum in the meantime. Today news has emerged that LightSquared have failed to make the $56.25M payment to Inmarsat that was due upon completion of the Phase 1 spectrum transition, which Inmarsat certified was complete on Saturday February 18. This development is hardly surprising, because as I indicated last week, LightSquared’s investors were adamantly opposed to the payment being made. LightSquared are claiming that there are “several matters to be resolved” before the payment is due, apparently suggesting that Inmarsat have not fitted filters to their own equipment as they were being paid to do in Phase 1, while Inmarsat are stating “categorically that we have fulfilled what was required on Phase 1 of the agreement”. Intriguingly, Inmarsat apparently believe that it is not necessary to actually fit filters to their terminals in order to fulfil the Phase 1 conditions, simply that they must be willing to accept any interference generated by LightSquared’s terrestrial operations (which of course will not arise because LightSquared have been forbidden from actually operating a terrestrial network by the FCC). It would be strikingly cynical if Inmarsat hadn’t bothered to fit any filters (and as far as I know no equipment has been retrofitted to date), because they always believed that GPS interference issues would prevent LightSquared from actually getting into service. However, that certainly seems to be the most plausible interpretation of what has happened, because (independent of GPS) serious problems could arise with maritime and aeronautical safety services (on Inmarsat terminals without filters) if LightSquared did actually commence terrestrial operations at this point in time. UPDATE (2/22): Inmarsat’s ATC team wanted me to know that they exist and have been working to develop ATC-resistant terminals. I know that some ATC-resistant terminals (e.g. IsatDataPro, ISatM2M, BGAN M2M, ISatPhone Pro) are already on the market, but my point above was that there has been no attempt to retrofit existing terminals used for maritime and aeronautical safety services. Indeed, Inmarsat told its partners in April 2011 that the timeline for introduction of SwiftBroadband aero safety services (which will provide ATC-resistance) “envisages flight trials in early 2013 leading to safety certification during 2014″. As a result of LightSquared’s failure to make the payment, Inmarsat has issued a Notice of Default, which gives LightSquared 60 days to make the payment or else the Cooperation Agreement will be terminated. The key question now is whether the simple receipt of this Notice (as opposed to termination of the Cooperation Agreement itself) is sufficient to cause an Event of Default on LightSquared’s first lien debt. Although LightSquared are arguing that the Notice is invalid (because they claim Inmarsat have not fulfilled the Phase 1 requirements) that may ultimately be irrelevant if LightSquared’s investors now try to force the company into bankruptcy. I’m sure we will see a lot more news on this front in the next few days. After a very eventful day, Mr. Falcone is claiming that he has a cunning plan and that bankruptcy “is clearly not on our table”. However, it certainly appears to be on the mind of LightSquared’s investors, who are laser-focused on stopping the $56.25M payment to Inmarsat, which is expected to be made on Tuesday next week, after the President’s Day holiday. Under pressure from investors (and UBS), LightSquared has now reportedly hired restructuring advisers from Moelis and Company, but it appears that Mr. Falcone is actively resisting UBS’s entreaties that the best way forward would be to file for bankruptcy and stop LightSquared’s cash draining away. Indeed it appears that LightSquared may have cash expenses totaling nearly $200M between now and early April, of which the vast majority would go to Inmarsat. If Mr. Falcone continues to resist then I suspect the next step may be for Mr. Icahn and others to initiate a rather more public dispute with Harbinger. Part of this cunning plan may be to seek a spectrum swap for part of the AMT band (1515-25MHz), which LightSquared reportedly pitched to the DoD last month, despite the “extremely formidable difficulties” this would entail. Of course it is hard to see why the DoD would want to give up this spectrum, when it seems implausible that they could use the L-band satellite spectrum for these terrestrial operations instead, and being directly below the 10L block, it is not a foregone conclusion that there would be no interference to GPS. As a result, that element of the plan does not appear to be a particularly viable near term option. If harmful interference is caused to other services by ancillary MSS ATC operations, either from ATC base stations or mobile terminals, the MSS ATC operator must resolve any such interference. If the MSS ATC operator claims to have resolved the interference and other operators claim that interference has not been resolved, then the parties to the dispute may petition the Commission for a resolution of their claims. It will therefore be very interesting to see how the FCC rules. With a comment deadline of March 1 and no reply comment period, it appears that the FCC wants to dispose of this matter quickly, though any ruling will certainly have to be very carefully written to withstand legal challenges. It seems that for the moment Harbinger are trying to keep their options open and hoping that either the DoD or FCC throws them a bone, before major payments are due at the end of March. However, it is inconceivable that a spectrum swap could be engineered in that time period and it hardly seems plausible that the FCC would proactively offer taxpayers’ money to LightSquared by way of compensation. With respect to some of the other developments today, it is notable that Sprint are claiming they would only have to return $65M of the $310M that LightSquared had paid by the end of September. That is a big shock because I had assumed Sprint might return at least $200M to LightSquared’s creditors. If LightSquared remains determined to pay yet more money to Inmarsat and might only recover a small fraction of its advances to Sprint, then that is a very negative sign for LightSquared debtholders. So this evening the NTIA has released the reports on the latest LightSquared GPS interference testing, along with its recommendation to the FCC that “LightSquared’s proposed mobile broadband network will impact GPS services and that there is no practical way to mitigate the potential interference at this time”. “To drive economic growth, job creation, and to promote competition, the FCC has been focused on freeing up spectrum for mobile broadband. This includes our efforts to remove regulatory barriers that preclude the use of spectrum for mobile services. To advance these goals, the Commission runs open processes – the success of which relies on the active, timely, and full participation of all stakeholders. “LightSquared’s proposal to provide ground-based mobile service offered the potential to unleash new spectrum for mobile broadband and enhance competition. The Commission clearly stated from the outset that harmful interference to GPS would not be permitted. This is why the Conditional Waiver Order issued by the Commission’s International Bureau prohibited LightSquared from beginning commercial operations unless harmful interference issues were resolved. “NTIA, the federal agency that coordinates spectrum uses for the military and other federal government entities, has now concluded that there is no practical way to mitigate potential interference at this time. Consequently, the Commission will not lift the prohibition on LightSquared. The International Bureau of the Commission is proposing to (1) vacate the Conditional Waiver Order, and (2) suspend indefinitely LightSquared’s Ancillary Terrestrial Component authority to an extent consistent with the NTIA letter. A Public Notice seeking comment on NTIA’s conclusions and on these proposals will be released tomorrow. Unsurprisingly, it appears that Chairman Genachowski wanted to get this issue off his plate before testifying to Congress on Thursday. It now seems the next steps will be a Public Notice, which may request comment on the terms of reference for a future receiver/interference standards proceeding, followed by a proceeding stretching well beyond the November 2012 election. Even if that resulted in a favorable ruling, the NTIA letter highlights that “lower 10″ operations would not be phased in for many years (2020 or beyond), which as I’ve indicated previously makes it extremely unlikely that it would be worthwhile preserving the current Cooperation Agreement with Inmarsat. Indeed, with Inmarsat poised to claim another $56.25M from LightSquared early next week, and the 90 day bankruptcy window for challenging the $40M paid to Inmarsat in November expiring on Thursday this week, a decision may need to be reached on how to proceed very soon. With LightSquared set to run out of money in the near future, the company must now consider whether to file for bankruptcy and preserve its resources for the inevitable litigation fights, or continue pretending that all of these problems can be overcome while its cash drains away. It seems that even if LightSquared does continue to pretend that all is well (and remember that LightSquared’s relentlessly optimistic/deluded CEO told the FT only a few days ago that he was confident the FCC would “do the right thing” and approve the network), then its debtholders will certainly assert that the FCC’s action means a MAC has occurred under the first lien debt covenants. However, it remains unclear whether that event would occur upon release of the FCC’s Public Notice tomorrow, or only when a final Order is issued, which may not take place for several months. Today AT&T has put up a blog post asserting both that “wireless data volume on our network continues to double annually” and that “over the past five years, AT&T’s wireless data traffic has grown 20,000%”. However, those statements can’t easily be reconciled with AT&T’s previous pronouncements in March 2011, when AT&T presented statistics claiming that traffic had grown by 8000% over the four years from 2007 to 2010 (because 20,000% growth in five years would imply ~150% growth in 2011). However, even more importantly, AT&T’s blog post is somewhat at variance with their assertions to investors that traffic is currently growing at ~40% annually, as I noted in a story for GigaOm on Saturday. So what’s the actual answer here? One factor appears to be that AT&T’s blog post is apparently obfuscating the issue by changing its definition from “mobile data” (in March 2011) to “wireless data” (in the current blog post). In other words, AT&T’s WiFi offloading (at Starbucks, Times Square, the Superbowl, etc. ), which is helping to drastically reduce the growth of (on-network) “mobile data” traffic, is presumably now included in their statistics. Another factor is that AT&T claims the 40% growth was only intended to represent the increased usage of existing smartphone users, and the smartphone penetration expanded from 42.7% to 56.8% during 2011 (a 33% increase, so if all subscribers, including new ones, increased their individual usage by 40% then this would equate to 86% overall usage growth). 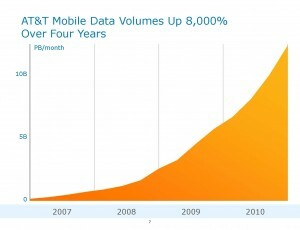 The best way to reconcile AT&T’s apparently contradictory statements would be to conclude that on-net mobile data was 8000% (of the end 2006 number) at end 2010, and including WiFi offload it was 10000% of this level. In other words WiFi offload was 20% of total AT&T wireless data traffic. At the end of 2011 total traffic was 20000% of the end 2006 number, and during 2011 AT&T has stated that WiFi traffic tripled. Thus, it seems reasonable to assume that WiFi offload was ~6000% of the end 2006 number and on-net mobile data was ~14000% of the end 2006 number. In other words, on-net mobile data traffic volumes grew by ~75% (not 100%) in 2011 and ~30% of AT&T’s overall traffic was on WiFi. As a cross-check, AT&T indicated that there were ~200M WiFi sessions on its network in Dec 2011, and if the above analysis is correct, there would have been about 9PB of WiFi data transmitted and received. That’s 45MB per session, which doesn’t sound too far off when “hotel locations account for approximately 45 percent of the total AT&T Wi-Fi network traffic”. However, unless and until we see some more specifics on data volumes for AT&T’s cellular network (separate from its WiFi network) it will be very hard to be certain just what the growth of on-network traffic really is. Regardless, AT&T’s 40% traffic growth per user is far less than the 86% CAGR in data usage projected by Cisco today for US smartphone and tablet users between 2011 and 2016. For comparison, 40% CAGR for five years is about 5x growth in traffic, whereas 86% CAGR is equivalent to 22x growth in traffic per user. So the latest version of Cisco’s VNI mobile data traffic forecasts has been released today, and yet again Cisco are predicting a “data deluge“. However, there appears to be huge uncertainty in their forecasts due to the impact of data “offloading” (to WiFi and fixed broadband networks). As others have noted, Cisco “heavily downplays” the role of WiFi in future networks, and has gone so far as to drop the table in its Feb 2011 report which depicted the amount of offloading they projected by country for tablets and smartphones. 23% of the United States’s mobile data traffic was offloaded in 2011. 37% of the United States’s mobile data traffic will be offloaded in 2016. 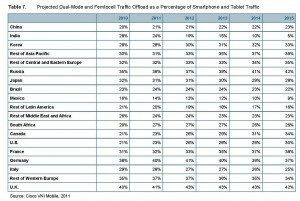 49% of the United States’s handset/tablet mobile data traffic was offloaded in 2011. 46% of the United States’s handset/tablet mobile data traffic will be offloaded in 2016. Though the first two assumptions appear at first sight to be broadly comparable with Cisco’s 2011 assumptions, in reality the comparison should be lines 3 and 4 giving the handset/tablet traffic. In Feb 2011 Cisco apparently believed that US smartphone/tablet users offloaded 21% of traffic in 2010, and that this would increase gradually to 30% of traffic in 2015. Now Cisco appears to believe something completely different, that almost half of mobile data traffic is offloaded, but that is set to decrease in the future. So was Cisco just drastically wrong in their assumptions about offload last year? Is that why they are trying to hide the change in assumptions? What basis did Cisco have for these assumptions last year and today – are they based on real measurements of offloading or just guesswork? And just how much credence can we give to their current offload assumptions? In the United States, smartphone mobile data traffic will grow 41-fold from 2011 to 2016, a compound annual growth rate of 110%. In the United States, smartphone mobile data traffic will reach 1,047,312 Terabytes per month in 2016. 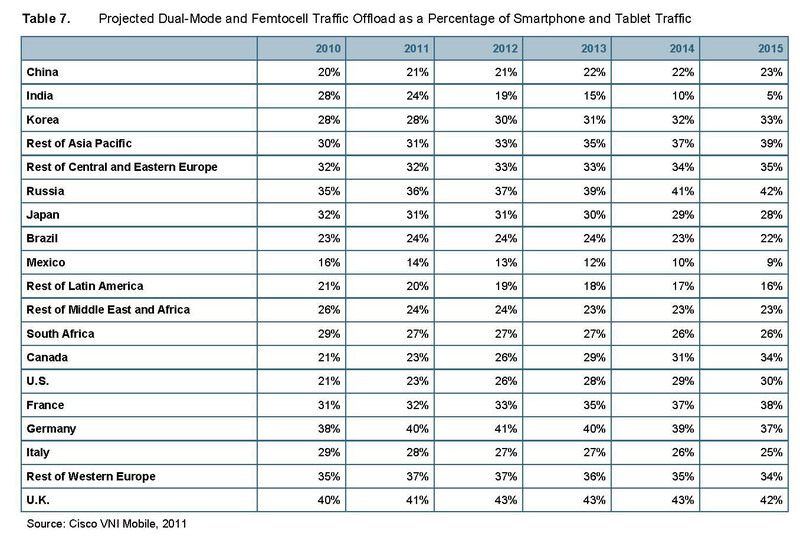 In the United States, smartphones will be 60% of total mobile data traffic in 2016, compared to 24% at the end of 2011. In the United States, the average smartphone will generate 4,524 megabytes of mobile data traffic per month in 2016, up 2,146% from 201 megabytes per month in 2011, a CAGR of 86%. Simply put, Cisco needs to do a much better job of justifying its offloading assumptions and stop trying to hide the ball. GigaOm has highlighted that WiFi and offloading more generally are likely to be key themes for the wireless industry in 2012, and while this forecast may help to sell more boxes and provide fuel for the spectrum crisis narrative, Cisco is not doing its credibility any favors. As Henry David Thoreau wrote: “If you have built castles in the air…now put the foundations under them”. With apologies to Private Eye, it seems like everyone is trying to grab as much of LightSquared’s cash as they can, while there is still some left in the bank, and run away before they get sued. I’m told that Inmarsat is poised to assert completion of its Phase 1 transition (freeing up two 2x5MHz blocks of spectrum, known as 5L and 5H) on February 18, which would entitle it to a payment of $56.25M. In addition, it appears that the spectrum blocks used for augmentation signals by Starfire’s precision GPS receivers will be moved in late March (though it should be noted that this shift does nothing to protect these receivers from experiencing interference if LightSquared was ever to begin terrestrial operations). However, once this relocation has taken place, Inmarsat should also be able to claim completion of the Phase 1.5 transition by April 1 (freeing up the lower 2x10MHz block, known as 10L) under the April 2011 amendment to the Cooperation Agreement, which I’m told would entitle it to another very substantial sum of money (many tens of millions of dollars) over and above the $40M already paid. This is an additional cash outlay that I had not considered in my previous estimates of LightSquared’s cashflows, and although it is not enough in itself to exhaust LightSquared’s remaining cash resources, it certainly could be another potential hit to the ultimate recovery for LightSquared’s creditors (unless they can recover this money via the lawsuits that will inevitably be filed against Inmarsat and other parties at a later date). UPDATE (2/14/12): I’m told that Starfire will be relocated to somewhere in the 1536-1544MHz spectrum block, implying that Inmarsat’s focus is on strict compliance with the terms of the Cooperation Agreement (so they can claim more money from LightSquared), rather than on creating a long term solution for these users (which would involve placing the augmentation downlinks close to the top of the band around 1559MHz). That’s unsurprising because Inmarsat emphasized previously, in a confidential June 2010 letter to the FCC (included in the recent FOIA production), that they would only be doing the work LightSquared paid them to do, and nothing else. At the House Aviation Subcommittee hearing last Wednesday, it was indicated that the NTIA’s report and recommendations would be transmitted to the FCC “shortly”, and although the report was not released on Friday evening, it seems all but certain that we should hear more this week, potentially followed very quickly by an FCC ruling to initiate an interference/receiver standards proceeding. The testimony of Mr. Porcari, Deputy Secretary at the Dept of Transportation, and co-signatory of the Jan 13 Excom letter could not have been more clear in stating that “[The Obama Administration has] concluded that [LightSquared's] current plan to provide such services adversely affect GPS signals” and “LightSquared’s proposals are fundamentally incompatible with GPS use”, so it now seems that the FCC will be bound to indicate that LightSquared will not be permitted to build and operate a terrestrial network for the foreseeable future. However, the precise language of this ruling will be critical in establishing whether a Material Adverse Change has occurred under LightSquared’s debt covenants. With Inmarsat apparently intent on securing as much money from LightSquared as it possibly can in advance of a bankruptcy filing, and no chance of a favorable ruling from the FCC, LightSquared’s creditors will now presumably be keeping their fingers crossed that in the very near future they have the chance to assert that an event of default has occurred, and stop LightSquared’s cash from draining away, perhaps even before the next payment is made to Inmarsat on February 18. So the Looney Tunes cartoon (think Wile E. Coyote) that has been LightSquared over the last year appears to have finally run its course, with LightSquared today effectively conceding defeat by asking the FCC to initiate what will inevitably be a multi-year receiver standards proceeding (followed by an even longer transition period for any such standards to come into effect). Today’s press conference was called at very short notice and appears to have happened in response to the impending release of the NTIA’s report and recommendations, which are also likely to call for an investigation into potential future receiver standards and indicate that LightSquared should not be allowed to operate its terrestrial network in the meantime. Rather than waiting until March for comments on LightSquared’s Petition for Declaratory Ruling, the FCC now appears determined to clean up any loose ends and get this issue off its plate as soon as next week, before Congressional hearings into the procedures it followed in granting the LightSquared waiver get underway. Indeed the FCC Chairman stated after the Public Notice was issued on Jan 27 that the Petition for Declaratory Ruling would not affect the timeline for the FCC’s next steps. It therefore wouldn’t be unreasonable to suppose that LightSquared may have been given a strong hint that by asking for a receiver standards proceding themselves they could avoid a harsher ruling from the FCC mandating such a proceeding. Of course, the FCC may also be looking to deflect attention from its own release of some documents in response to the numerous Freedom Of Information Act requests that have been filed. Buried in this release are numerous damaging documents which raise questions about the apparent coordination of LightSquared’s November 2010 waiver request with FCC staff prior to it being filed (and incidentally disclose LightSquared’s pricing plan of $6 per Gbyte for terrestrial capacity and $10 per Mbyte for satellite capacity, as well as the overall planned system capacity of 2800 Tbytes per hour terrestrially and 100 Gbytes per hour via satellite) which led to it being put out for comment immediately. It is also unclear whether this meeting with LightSquared on November 16 was disclosed in any ex parte filing. Indeed LightSquared had also been discussing with the FCC a change to their business plan to only launch one satellite, which has never been disclosed publicly (except in one accidental comment that I blogged about at the time). However, potentially even more damaging are documents related to the conditions imposed on LightSquared (then SkyTerra) as part of the Harbinger transfer of control proceeding which led up to the FCC Order in March 2010. As part of these conditions, SkyTerra agreed not to lease spectrum or more than 25% of its network traffic to AT&T and Verizon, which met with a furious reaction from those two companies, who described this restriction as “manifestly unwise and potentially unlawful“. After AT&T and Verizon filed petitions for reconsideration, enquiries from Congress prompted the FCC Chairman to write a letter asserting that these were “voluntary commitments [Harbinger] made” (as opposed to something the FCC imposed). That was always a very suspicious assertion, given it is hard to see why Harbinger would have wanted to limit its ability to do a deal with AT&T or Verizon. The FCC’s FOIA releases in fact confirm that Paul de Sa at the FCC appears to have initiated the discussion of conditions “on build out and wholesale agreements…to ensure the public interest benefits of the build out” in November 2009 and he apparently was responsible for drafting the written version of these conditions (in an internal FCC meeting) after meeting with Harbinger (again apparently with no ex parte filing) and persuading them to sign off in late January 2010. With this background now revealed, its hardly surprising that Sen. Grassley has a lot of questions he wants to ask, which presumably should relate not only to the January 2011 waiver, but also to the March 2010 transfer of control.